Close to the major hospitals including HCor, Beneficência Portuguesa and Edmundo Vasconcelos. Pet-friendly hotel! Dogs and cats weighing up to 44 lbs (20 kg) are welcome - charges apply. The flavors of contemporary haute cuisine combined with international culinary influences and the standout features of Brazilian cuisine make up the menu prepared by chef Jean-Christophe Burlaud served at our restaurant. Nights with happy hour and DJ. An inviting atmosphere, ideal for business meetings or a friendly chat. The TasteIT bar's vibrant happy hour offers great entertainment with live music Monday to Friday. The bar features an extensive drinks and tapas menu, the Vinoteca wine-by-the-glass concept, and a wine cellar stocked with Cachaça and Vodka. Excelent Hotel and Service. Shower can improve. 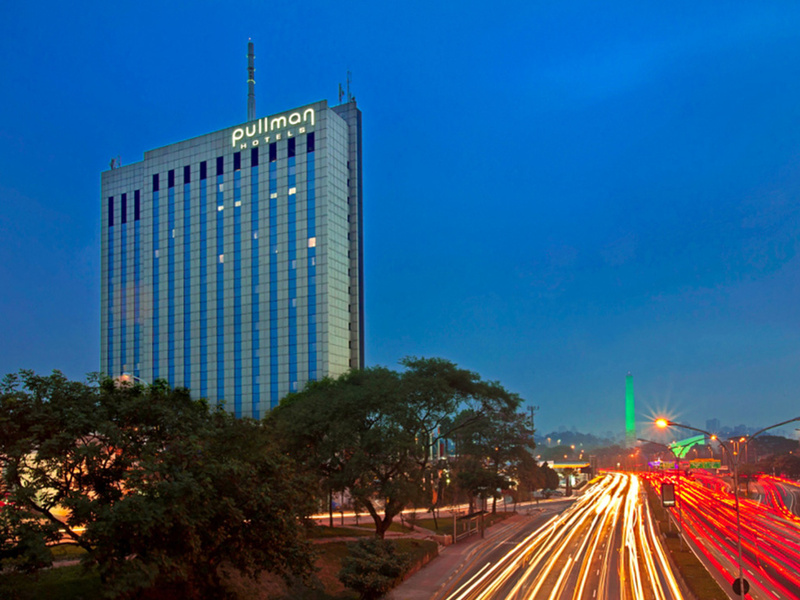 Perfect days staying in Pullman Ibirapuera. Room service, cleaning, check-in and check-out experience were fantastic. The only bad point was the shower. Water pressure is low, and the experience tooking a shower was dissatisfied. The hotel staff is very professional and friendly. Antonio in the restaurant did an incredible job! My room was very clean and comfortable as always. Great hotel, excellent staff and the room was simply amazing, very comfortable. Clean, inviting room; but adjourning room and issue with air conditioner made stay less than ideal. Room was clean and inviting. But, my room had an adjourning door where I heard every word from the room next to me. Very frustrating after a long overnight flight and looking to get sleep. Service in breakfast area was slow. I had to wait for attendants for both coffee and made-to-order items. But overall section was good and employees were friendly. Air conditioner did not get below 25.5C on second night. Made room hot and uncomfortable. When I go to a hotel, I have certain expectations. Two of them are having an a/c that works, and another one is being sure that I have privacy, so no employee will enter my room without knowcking at it. You completely dessapointed me in this two points. Early check in was helpfully arranged on arrival. Breakfast was very good. Gym facilities and pool both good. Herve, Guest Services Manager, was very helpful with arranging a driver and attentive throughout the stay. Good location for exhibitions at Sao Paulo Expo. As usual, a great time at the Pullman! Overall, highly rated, but bathroom dimensions for counter and toilet are too tight. It's was a great experience, tho I did notice some fixtures in my hotel room were showing signs of damage, that's about all. Was a good experience. Staff very kind. I miss a proper desk to work. And more pressure in the shower, but was comfy. Great hotel facilities but I did not like the location. Stay at Pullman is a great experience. Always an excellent experience to be in this hotel with very kind and proactive employees. Overall, the hotel experience is very solid for a business oriented property. Conveniently located and containing all the core amenities a business visitor would want, this hotel is a solid choice for anyone to Sao Paulo. While the rooms are basic, the lobby, spa, gym, and restaurant are all top notch. The food is excellent and there are lots of choices. I would recommend this hotel to colleagues.